If you want a very inexpensive but durable way to put your phone number on a dog collar, buy a little bottle of the 3D fabric paint sold at most craft stores. This is that plastic-like puffy stuff that was so popular on T-shirts in the '80s. Just write your number on the collar, let it dry for 24 hours, and you're set! One little bottle costs less than $2.00 and will do a dozen collars, easy...probably even more. It keeps well...just screw the cap back on, like a marker, so you don't have to use it all at once. It really makes the writing stand out, even when the collars get dirty and worn. At that price it's easy to reapply if it wears off before the collar wears out. They make it in every imaginable color, too, so no matter what color dog collar you use, you can find something that will stand out (literally)! Greenhouse supply business can make shade cloth covers for dog pens. Not only can you select the percentage shade you want, but you should also be able to have the material sewn to your dimensions with grommets included at intervals of your choosing. While not super cheap, this stuff is still generally priced better than what is offered out of kennel supply catalogs. You can also call around to various green houses, nurseries and the like at the end of the shade requiring season to see if these places have some used shade cloth you can take off their hands. First, although expensive, stainless steel water buckets are a worthwhile investment. They do not rust and can't have the bales chewed off and there are no seams to pop, as in galvanized buckets, to reveal possible lead soldering to leach into the drinking water supply. The TIP is the way to hang the buckets. We use "bucket guards" made out of galvanized pails slightly larger than the 9 quart stainless buckets we use for drinking. The galvie buckets have their bails removed and in their place are attached spring clips (the end attached to the galvie pail is permanent). The points of attachment depend on what they're attached to and where. For instance, our buckets are all in the corner of our chain link kennel fence panels, so the two clips are positioned about one-third around the rim of the bucket. Next we drill a couple of drain holes in the downward most junction of the pail's bottom-side. Advantages of this system are several. One, the height of the watering bucket can be easily adjusted by simply relocating the spring clips on the bucket guards at a different point on the fencing. This is especially helpful after a major snowstorm. Second, in the winter there is no need to struggle trying to dismount the stainless steel bucket from a clip frozen to the fencing as it simply rests comfortably and freely inside the bucket guard. Three, for some reason, the air gap between the stainless steel buck and the galvie bucket guard slows down the rate at which the water freezes, at least in our neck of the woods! The only drawbacks to the system are the cost of the stainless steel buckets and the fact that some naughty dogs can, if they so desire, lift out their water buckets. In this case, we find that after temporarily clipping the stainless steel buckets in place, these dogs give up and find something else to do, like eat their dog houses! But that's OK as we have a tip for house building as well! 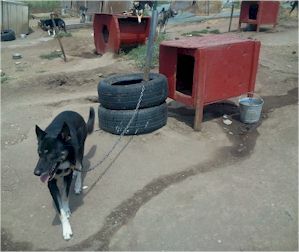 Here is a dog yard kennel tip for using old car tires. An easy way to elevate chains off the ground is to put a tire around the T-post. You can also use two tires to elevate the chain even more. The tires also double as an indestructible chew toy and has greatly decreased the amount of chewing on houses in my yard. Whenever you get the tires changed on your vehicles just request to keep them. You can also find old tires at the landfill or even local tire shops. I am fairly new to mushing--only my second year of addiction. With my kennel having grown to ten dogs, my kids were complaining that the 5 gallon bucket wire handles were digging into their hand when they feed dogs. My solution was to cut a small piece of foam pipe insulation, slipped it over the handle, then wrapped that with black tape (duct tape would work just as well). This provides a nice cushion at a cheap price. No more complaints about cutting off circulation! Powdered automatic dishwasher soap makes a great cleaner for dog pans and pails. It cuts through food "goo" faster and easier than any other cleaner we've tried. Dissolve a couple tablespoons in a sink of hot water and soak the pans. For extra stubborn goo, sprinkle a little directly on a cloth or sponge and watch it disappear. It is hard on your hands, so a pair of rubber gloves is a good idea. Out in the dog yard, one of our problems was getting hay/straw for bedding out to the houses. Using a regular toboggan sled, you lose a lot of hay once you cut the bale twines. We took a plastic 55 gallon barrel (the same ones we use for dog houses) and cut it in half lengthwise and attached a rope to one end - it makes a nice, deep sled for hauling hay. If you have a large kennel, the other half makes a great "poop sled" - much easier than 5 gal. buckets. Instead of hauling buckets from space to space, try one of those garden carts. Wheel the cart into the area, clean, move on to the next. Less back breaking then picking up the bucket and hauling it from area to area. Since they're plastic, they're light weight and easy to hose out to clean. Tough, inexpensive dogs bowls are available in the form of truck hubcaps. They are light, easy to clean and last forever. Since they are made of metal they are better during warm weather - but when filled with warm food in winter I have never had a problem with tongues sticking. My favourite? Those from Ford - they're Ford tough! If you don't have a beater truck that you can remove the caps from I suggest that you get them from the scrap yard. Getting them from a local parking lot might get you in trouble! If you haven't owned a series of beaters to remove enough caps for a kennel you can obviously afford to own a lot more dogs - if you stop spending your money foolishly on new trucks. Something for spring! Mint herbs are very(!) prolific and grow just about any where. I separate all my mint herbs and plant them around my dog kennels/ fences. Can be planted along edges of dog yards, as well. These not only smell good when brushed, but also act as an insect repellent. feed and water in the same pan to avoid algae build up. get the pan off the ground to avoid contamination with dirt and feces. eliminate as much bending as possible. We started with 1" x 4" wooden holders, which too many dogs considered chew toys. Then Steve designed holders made of simple steel banding from discarded wooden barrels. This is heavy banding, approximately 2" wide by 1/16" thick. He cuts them just long enough for the pans (stainless steel) to fit into loosely (the rim on the top of the pan holds them in) plus a good lap on the ends. He drills a couple sets of screw holes in each end to make them adjustable for slightly different size pans. They're attached about half way up the back 2' x 4' frame on the side of the doghouse and viola! clean pans, no algae, no dirt, no dumped water, no bending! Once in a while a dog will knock a pan out of the holder while vigorously finishing their meal, but it's nothing compared to bending over for every pan. I got tired of male dogs always peeing in the water and on their houses, so I place a log about 2 feet high between males who are tethered adjacent to each other. Rarely do they pee on their house now--they all try to out do the others by seeing who can pee on the log the most.. I guess they think anything the size of a fire hydrant is open game. What I do is cut a log about 18 inches high and stand it on its end on the outside reaching area of the males' chains. I do not plant the logs in the ground because I want to be able to move them around occasionally. To visualize this, each pair of males that are tethered next to each other has a pee log. 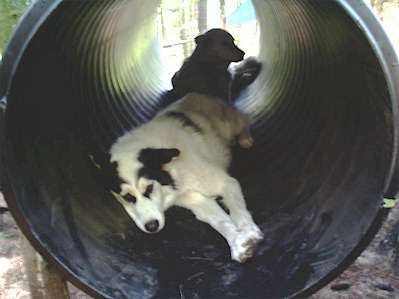 The important thing is to make sure the dog cannot get around the log, but if they do, it will fall over on its side. This is what I do to deal with poop piles and urine smell. Needed: 50# bags of hydrated lime (for 10 dogs I use 200# a year), 50# bags of garden/lawn lime, also known as sweet lime (200# for 10 dogs, and I have mostly males). First pick a place for your poop pile (in the woods if at all possible). This will help keep the flies down. Then put down a layer of hydrated lime down and start your poop pile. Every time there is extra straw from the houses or dog truck, put it on the pile. And whenever you put some straw down put a little more lime down. Continue until you feel that pile is big enough then put a whole 50# bag on it. Completely cover with straw and in about 1-2 years you will have the perfect flower garden fertilizer. I keep the winter and summer piles separate because the winter pile has so much snow in it that it tends to spread out more anyway. By summer the winter pile is big in area but not high. I have used my winter pile for 3 winters and have room for about 2 more. The summer piles compact so fast that they get to about 3 feet high pretty quickly. I use the sweet lime in the dog runs and on the side of the males houses. This helps keep the urine smell down and also keeps some pests away. Try to do it when it is raining lightly or when it is damp out. Sweet lime will not harm the dogs even if they eat some of it. If you're still using a shovel and hoe to clean the dog yard, give yourself (and your back) a break (!) with a pan and rake pooper scooper set. The working angle is totally different and much easier on the back! The rake works great in sand and snow but if cleaning a hard surface, the spade may be better. With the large pan, I can clean four or five dogs before dumping in the poop pail. The set costs less than $20 from most supply catalogs. There is a small version that works well for traveling. We take metal industrial dust pans, bend the handle up and screw a 1"dowel into the handle. Steve then cuts the dowel to a comfortable height and rounds the top of the dowel with a sander. The dust pans are bigger than the scoops you can buy and seems to last longer. For the blade, we check the hardware stores to find children's garden equipment (metal not plastic). We buy the hoes called "Real tools for kids" - they're lighter weight than a standard garden hoe. Priced about $10 a piece but they outlast the metal riveted scraper you buy with a "real" pooper scooper. We bend the blade so the angle is maximum for scraping. Cut the handle to a comfortable height. I like to provide plenty of interesting things for the dogs to do, to keep them entertained when they aren't running. (Besides digging holes and taking things apart, I mean). I noticed a short section of plastic culvert at a construction site in town, and asked if I could have it. Heaving the seven foot section onto the top of my dog box, I had opportunity to observe that they are made of very DENSE plastic. The dogs do chew on the edge from time to time, but they don't get very far. Best of all, the interior is curved and extraordinarily slippery. In negotiating it, the dog has to control its speed, place its feet carefully, and when more than one dog is in at a time, be extremely tolerant of being slipped on and stepped on. I've placed mine with the top edge on a dog house, and the lower edge on a stump that's slightly higher than half the height of the dog house. The slant makes water and snow drain out, makes the culvert lead to something interesting and makes it more challenging. Most of the dogs will run or walk through on command, and about half will use it to out-maneuver playmates during chase games. These two-year-olds just think it's a cool place to nap on a summer evening! I have a very small team, and house them all together in one big pen. No fighting goes on but we did have problems with my 2 males peeing on each others houses and in the food bowls immediately after they finished eating. I took 2 of the tin popcorn cans that everyone gets for Christmas, filled them with sand, and set them out in the middle of the yard about 5 feet apart. They now use those and never pee in bowls anymore or on houses. We all never know what to do with those popcorn tins. Now I know. If you put a tarp on the ground before you lay down straw or hay it will save you a little time cleaning up. Believe me, I found that out the hard way. For our "open" kennel I have devised a method of holding each bowl on top of each dog's house. All you need is a couple of eye-screws and a couple of �" compression springs for each bowl. To start you measure out where you need to put the eye-screws by placing the bowl where you want and placing the compression spring at the lip of the bowl and on an angle to the roof top of the dog's house. Bend one end of the eye-screw so that it fits over the rim of the bowl. You may not need to bend it much depending on the bowls you use. Remove from bowl and hook into the eye-screws. Now that you have 2 compression springs attached to the rooftop, you can place the bowl so that the springs will be able to be pulled over the edges of the bowl and hold it in place. This set-up works great if you have dogs that aren't staked out and so don't get tangled on the bowl, screws or springs. We have tried it with staked-out dogs and they do get tangled and you have to untangle and often have to replace the bowl holder hardware! The idea works as our dogs are in a two-dog pen and they all know what house they get fed upon. It keeps them from eating on the ground where contamination may occur and the holder means no more searching for a bowl under houses, in the trees or under two feet of snow. An added benefit is that the bowl doesn't move and the dogs are capable of fully cleaning the bowls meaning a cleaner kennel and better health! When it rains you can unclip one spring, empty, reattach and feed or if the roof is on a hinge just lift the roof until the bowl empties! If you use smaller sized springs you may need to increase to four evenly space springs but we have found that 2 of the �" springs will hold a bowl belonging to even our most ambitious (and possibly greediest of dogs). SAVE MONEY AROUND YOUR DOG YARD! 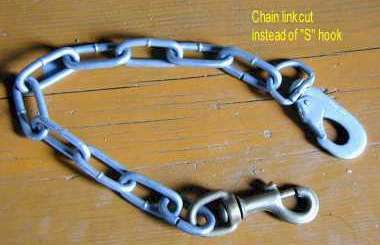 Instead of using "S" hooks or cold shuts to attach your snaps to chains, use the last link of the chain as the connector. Cut one side of the chain link at the end of your chain, open it with your "S" hook tool and then insert the snap and re-close with the "S" hook tool. We use this for every chain tie up we need! 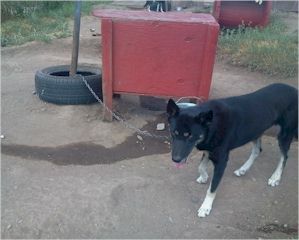 Dog yard, Drop chain at the truck...The metal from the chain is more durable than the "S" hook metal. On the subject of tie outs, the chains are best kept off the ground as shown in Mush with P.R.I.D.E. 's Care Guidelines. We use the pipe option. The problem we always had in winter is the pipe filled with water and leaves, which froze, preventing the rebar from turning. We tried drilling holes, which seemed to make the pipe easy to bend. To remedy this problem we used junk axle shafts from rear wheel drive cars in place of the rebar. The part the wheel bolts to served as a roof for the pipe, keeping the water out. The axles were easily obtained at the local junk yard from their core rear ends. Don't carry water pails all the way from the faucet in the summer--set up a stock water tank in or near the dog yard. It's easy to fill the tank with a hose and dip water out of it. Cover the tank with a small tarp held down with bungee cords to keep bugs and debris out. A cover also slows algae growth, but I just scrub the tank out whenever it's time to refill--a minor inconvenience compared to carrying pails from the house. I highly recommend the Rubbermaid stock tanks. We've used our original one for seven or eight years.